The Matilda 1 was slow, heavily armoured and armed with a single turret-mounted machine-gun: first a .303", then a .50" water-cooled Vickers, protected by an armoured shroud. It was envisioned as an infantry support tank, essentially a mobile pill-box, and therefore didn't require any more speed than that sufficient to keep up with advancing infantry. The Matilda 1 had one moment of glory at Arras in 1940, but it was built around a concept that was no longer valid in WWII, and after the retreat from Dunkirk most of them were left behind. It's perhaps significant that even the Germans, notable for making extensive use of captured equipment, didn't seem to have any use for the poor old Matilda 1. The tracks themselves are modelled relatively coarsely, though that's understandable considering the limitations of metal casting. 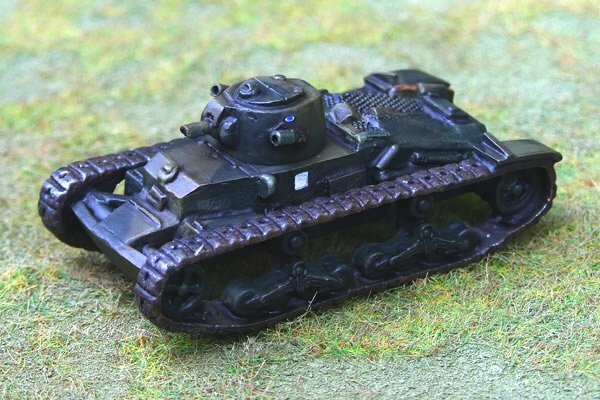 The Matilda's tracks were thin, narrow and rather flimsy-looking; this model's tracks look rather bulky, and lack much in the way of detail — the guide tabs on the interior, for example, are inconsistently modelled; sometimes they're there, sometimes not. I would have like to have seen an attempt at showing the track-sag that appears, from photographic evidence, to have been characteristic of the vehicle. The drive wheels are modelled without any sprocket teeth, which is rather disappointing. Even a token indication would be better than nothing at all. 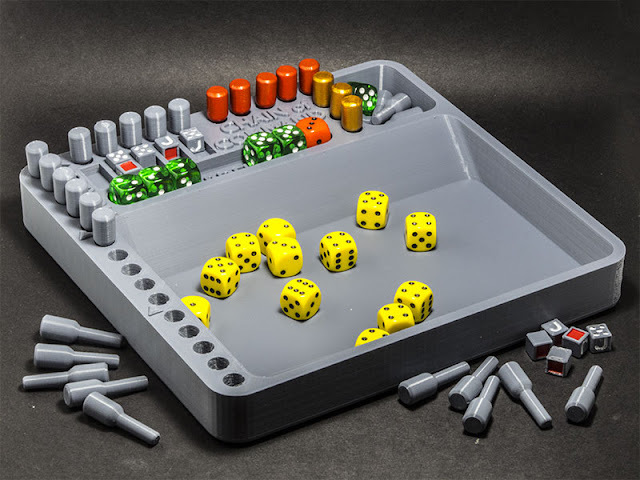 The model costs, as of 2010, £4.00 plus about £2.60 p&p — that's about $NZ 15.00 right now, so it's reasonable value for money compared with other manufacturers, even taking into account postage from the UK (£8.00 for three models). I managed to get my grubby mitts on a copy of Hordes of the Things, a set of rules for fantasy wargaming based on the systems used in De Bellis Antiquitatus, or DBA as it's generally known. Hoorah! I've been looking for a copy for quite a long time, but I always thought the price of a brand new copy was far too high, especially once postage from the UK was factored in. What I didn't know is that the copy I got was the first edition. Everyone around here uses the second edition. CRAP! I didn't even know there was a 2nd edition. Ah well, I'm not much out of pocket I suppose. Now I need to borrow somebody's 2nd Ed. rules and start annotating like crazy. I just bought the Advanced Edition Companion for Labyrinth Lord. This brings in a whole bunch of AD&D options to turn your Labyrinth Lord game into a sort of Advanced Labyrinth Lord game. But not completely. There's a whole bunch of character options, new classes, new spells, new monsters (and when I say new, I mean... they were new in 1978) that AD&D introduced that were pretty cool, and made for some really fun games. There's a whole lot of stuff, however, that just clogged everything up, and which most people coming from OD&D or B/X just ignored. This volume includes pretty much all the stuff that people didn't ignore. First, because I've found that a system that allows anything to be built using a points-based powers/liabilities system virtually demands that everything be so built. It's not impossible to wing it as a GM; in fact as long as you know the system really well it's not much harder than in more free-form systems. However, winging it in Hero is much more likely to come back and bite you in the arse than in less crunchy, rules-heavy systems. Second, because the incredible freedom the system allows to players in terms character creation makes the GM's job much, much more difficult, especially when they start creeping up to higher power levels. Anyway, all that aside, back to the Advanced Edition Companion. It's offered by Goblinoid Games in (I think) three forms: as a free PDF without any artwork, a PDF with black&white interior and cover art, and (I believe, though don't hold me to this) as a hard-copy. I actually unscrewed my wallet and bought the illustrated PDF. Normally I'm quite happy with art-free rules books, but this time I made an exception because of the demon and devil illustrations by Sean Aaberg, an artist whose name is new to me, but who manages to evoke the superb Trampier illustrations from the AD&D Monster manual without slavishly copying them. The other art is generally good too, though Sean's stands head and shoulders above it to me. Including the double-page cover illustration, the PDF is 161 pages, laid out in the archaic and irrational US letter size. I printed and bound mine in digest-size, and the text and illustrations are easily readable in the reduced format. It adds, as I've mentioned before, character options, spells, monsters and treasure from the AD&D era, but fully compatible with Labyrinth Lord (and pretty much any other OD&D or B/X clone). The layout is clear and easy to follow, and illustration has been used sparingly for the most part — the bulk has been reserved for the Monsters chapter, where it belongs. I haven't yet decided to what extent I'll include the content in my own game. I'll certainly use the monsters (though many, if not most of them already appear in the S&W Core Rules or Monster Book), and I'll probably introduce a good few of the spells. As far as the expanded character classes go, I'll take them under advisement — I've tried to keep the number of individual classes to a minimum with my class/sub-class house-rules, but I'm not sure that it's working entirely successfully. The magic items... well of course I'll use those. You can never have too many magical gee-gaws around to lure your players to their doom. The free PDF gives you all the information you need, but for $5.95 (yankee dollar) the illustrated PDF is very good value for money. I recommend it wholeheartedly for Labyrinth Lorders (and other OD&D retro-cloners) who want to introduce the fun bits of AD&D and leave the clutter behind.